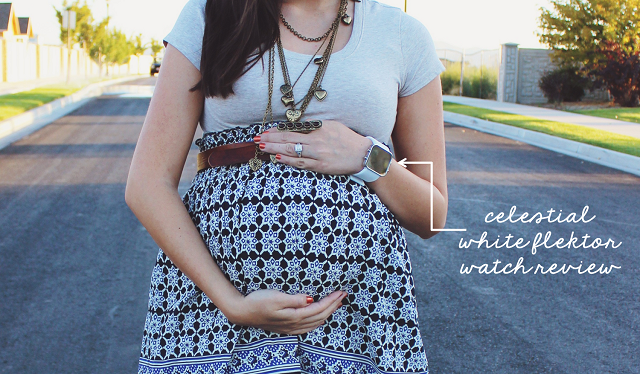 You may or may not have noticed the amazing watch I wore in my 32 week maternity post but I absolutely love it. The wonderful people over at kno(Name) sent me one of their flektor watches to review. 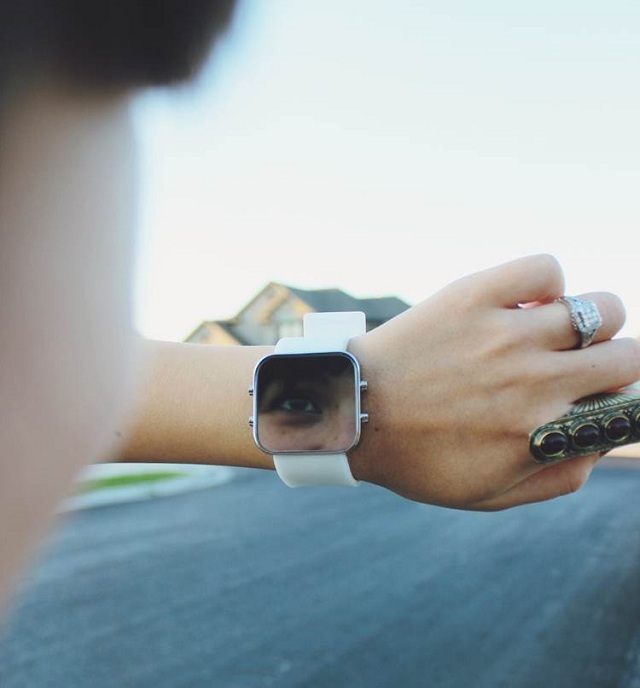 This watch is so unique because it is not only a watch but works as a mirror and spy tool. I wore it earlier this week to my sisters powder puff football game and I had fun watching the obnoxious high school students around us ;P It was also nice to do little lipstick checks throughout the evening! When I first showed the watch to my husband he thought it was just a mirror but if you hit any of the buttons on the side the time lights up! I personally don't wear watches very often because I'm very picky about what accessories I like to wear on my wrist. What I love so much about the flektor is that there isn't a huge logo anywhere in sight and that it's design is very simple. Another thing I love about this product is that it's perfect for both men and women and comes in a variety of colors! I personally went with white because I think that white goes with everything (; I also have good news for all Dearest Lou readers! (kno)Name is offering 15% off your entire purchase, this is just in time for the holiday season. Just enter the discount code: dearestlou15 during checkout. 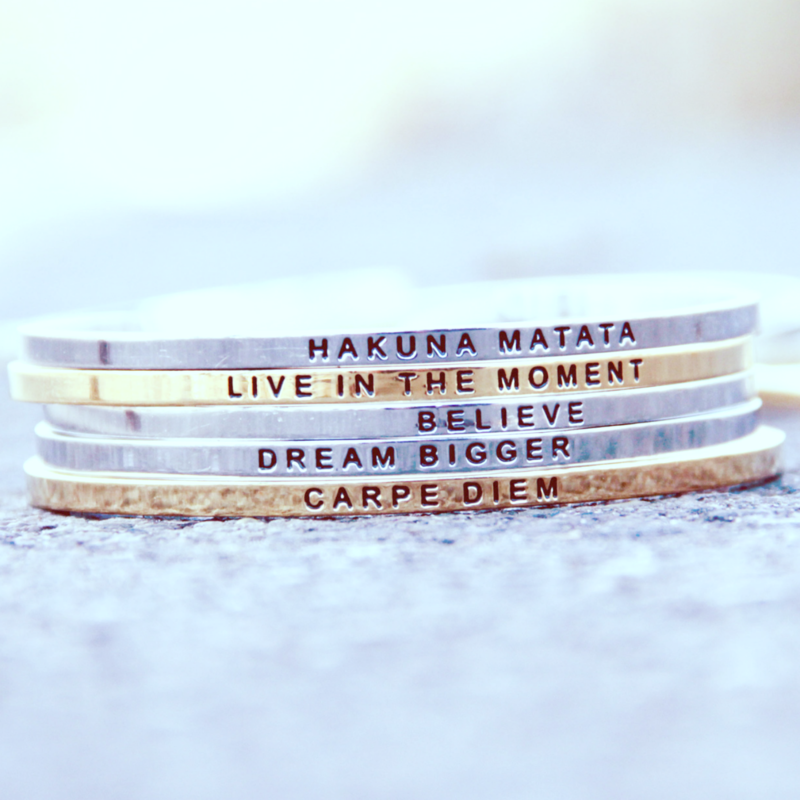 I am obsessed with these watches!! gorgeous bump in the photo there. and love the watch! Cool watch! I had a mirror watch in high school. I'd try to hypnotize people with the shiny reflections all the time. So much fun! But your watch is waaaaay cooler than mine ever was. It's adorable! (And you just look amazing by the way). That is very cool. I've never seen anything like that before. Oeh! I really like the watch I think it looks gorgeous and it's such an original idea! That seems to be a pretty interesting watch! :) Thanks for sharing! PS. I will text you or something about maybe meeting up Monday or Tuesday. I REALLY want to, but I have seriously been waddling and so I'm trying to avoid going out in public :) I hope we can get together soon! Join our giveaway, worth 326USD. aw, that is so cool! That watch is pretty awesome, I love how practical and versatile it is too! Great concept and design. FYI loving your blog lovely and am happily going to follow you! Hope you'll do the same and we'll stay connected!